In a heavy pan saute garlic, celery and onions in butter. 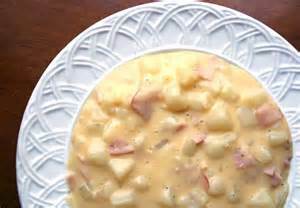 Add in ham and potatoes, cover with water and bring to a boil, 10 minutes. Lower heat and allow to simmer, add in heavy cream. In separate pan boil the other potatoes. Once they are fork tender drain and mash. Slowly add mashed potatoes to the broth to thicken it.